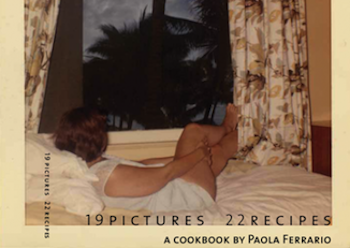 Cover of "19 Pictures, 22 Recipes" by Paola Ferrario. Mainstream cookbooks tend to present a particular style of photography: food spreads done up like the models of fashion magazines. Stylized still lifes, cropped, color saturated, and Photoshopped look too perfect to be true, or sometimes even to be edible. Yet glossy pictures are said to make the best cookbooks and in turn make cookbooks best-sellers. With her new publication 19 Pictures, 22 Recipes, Italy-born photographer and former Guggenheim fellow Paola Ferrario is bucking this trend; she has forgone pictures of food altogether in favor of found photographs of people and landscapes. Recipe for Bruscitt, excerpt: "...If details were rendered we would see the heaviness and roughness of coats, the ages of shoes and hats, and the stains on beards." Ferrario began writing 19 Pictures, 22 Recipes in 1994, but had until recently been unable to find a publisher. “Many people and agents said that it would be hard to sell because bookstores and sites would not know how to categorize it,” she explained in a recent email. “So finally, in 2010, I decided to self-publish.” Nineteen photographs purchased from flea markets and antique shops around the globe are each paired with a recipe (many of which belong to Ferrario’s family), a short text, an analysis, and a personal memoir and/or hypothetical narrative. Cime di Rapa is paired with an image that could have easily been part of Jacob Riis’ How the Other Half Lives; you get the sense that food was hard to come by for his subjects. With this and other photographs calling to mind the Great Depression, 19 Pictures, 22 Recipes doesn’t always inspire one to cook, yet it’s still incredibly charming. Recipe for Gravlax, excerpt: "In a perfect world social awareness would prevent politically incorrect seductions, but we are flesh, eyes and keepers of imperfect desires and the world of the beautiful boy can easily plant longing in our hearts...."
Ferrario is skilled at unearthing hidden or overlooked pieces of our daily surroundings. Her own practice might be described as photographing the “unmonumental”–remnants of the natural or built environment, the everyday assemblage. Her photographs ask viewers to consider mundane details like the many flavors of a complex dish. “I’ve always seen photography and cooking as being closely related,” she writes in 19 Pictures, 22 Recipes. Her approach to each discipline, however, is “diametrically opposed,” not due to personal preferences but rather the temperament of her materials. “I always use measuring instruments to shoot and develop…In the kitchen, on the contrary, I ignore measuring cups and scales and choose as tools of comfort knives, cutting boards, and various pots and pans.” Though both processes are prone to human error and surprise outcomes, Ferrario makes food sound more forgiving than a photograph, cooking more variable than making pictures. Recipe for One-egg Cake, excerpt: “If you can’t see yourself building your own home bake, a cake. A freshly baked cake and this photograph produce in me a sense of admiration for people who can do tasks which require skills that are no longer routinely imparted in our society...."
Grease and then line with wax paper the bottom of an 8” x 8” x 2” cake pan. Heat oven to 350 degrees F. With an electric mixer beat together shortening with sugar and egg. Combine all the remaining dry ingredients together in separate bowl and mix well. With mixer resume beating the shortening, sugar, and egg mix; alternate pouring in milk and vanilla and the dry ingredients. Pour into pan and bake for 45 minutes. All excerpts and images are courtesy of the artist. Ferrario has two upcoming reading and cooking events on October 2 for the “underground” supper club in Providence, and November 5 at Fante’s in Philadelphia.